They say you can tell a lot about a person by the games choose to play. Well, the time has finally come. Here at 4Player Tower, the ball is finally rolling on the production of our Top 10 Games of All Time and to kick things off, we are debuting Brad's definitive list! Brad has been with us since the very beginning and he has praised a countless number of games during his tenure BUT these are the games that have connected with him on a deeper level. These are the games that he loves above all others! THESE are the games that have made Brad into the man you all know and love. 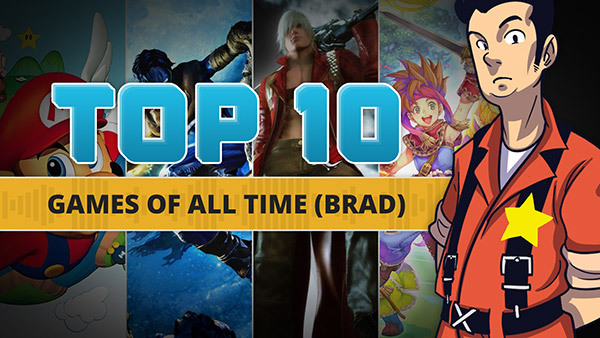 Whether you are looking to see how well you think you know Brad or you are looking for some older games that slipped under your radar, you've come to the right place! Production on this series continues so expect additional videos with lists from other members of the staff in the coming weeks! In the meantime, Brad would love to hear from you about his list so drop us a comment below or shoot him a tweet (@FolderBrad) directly to chat about his choices!